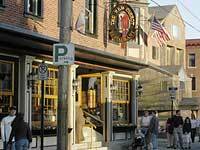 Here are some of the more popular and fancy romantic restaurants located in downtown Newport on Thames Street. We'd like to stay in a motel in Newport and eat at a different restaurant every night! Of course there are many more restaurants there, especially the dock and dines on the waterfront. I'm sure at night, the nightclubs there also are very exciting. 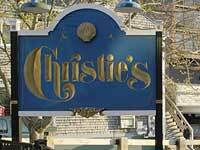 Christie's specialty is seafood. Huge shrimp, clams, swordfish, scallops and sole. Their lobsters come fresh from Narragansett Bay. You can dine inside or outside. Stroll around, and view all the beautiful surroundings. The Red Parrot Restaurant in Newport, RI takes up the whole east corner of Thames St. and Memorial Dr in Downtown Newport. The restaurant and bar features live jazz, steaks and seafood with a Caribbean flair. 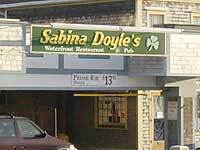 Newport, RI Sabina Doyles Restaurant in downtown Newport, RI has waterfront dining along with an Irish theme. There is a sign outside that says Prime Rib $13.95. Their motto is, "There are no strangers here, only friends you haven't met." Sounds like a good place to dine doesn't it? 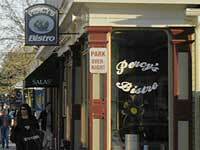 Newport, RI Percy's Bistro is a corner restaurant located across from the Red Parrot Restaurant in downtown Newport. Their seafood is superb, pastas are perfect, and their prices will keep you coming back. Newport, RI Salas Dining is right next to Percy's Bistro. 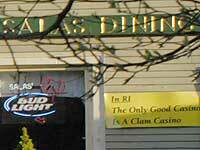 Their motto is In RI the only good casino is a clam casino. That should give you some idea of how serious they take their cooking. Specializing in Italian dishes, yet everyone loves their Oriental Spaghetti. They also have lobster for the seafood lover in your family. An affordable, family-friendly restaurant. The Rhino Bar & Grill offers an extensive lunch & dinner menu with a drink selection that includes draft beers, malt beverages, over 20 bottled beers, a specialty martini menu, frozen drinks, margaritas, wine and more. Welcome to the Rhode Island Quahog company. We serve the freshest seafood and more Clams than you can imagine !! !